This article first appeared in Personal Wealth, The Edge Malaysia Weekly, on February 26, 2018 - March 04, 2018. The funds under the Private Retirement Scheme (PRS) had a good 2017, with rising assets under management (AUM) and a rapidly growing membership base. On average, the funds performed commendably. The asset management companies attributed their performance to factors such as a recovery in global trade, an improvement in corporate earnings and soaring stock markets the world over. Securities Commission Malaysia (SC) chairman Tan Sri Ranjit Ajit Singh recently announced that the total AUM of the existing 56 PRS funds rose some 47% to close the year at RM2.23 billion, up from RM1.51 billion in 2016. The voluntary retirement savings scheme, which was launched six years ago, saw a record 301,279 members last year — a 36% increase from 221,235 in 2016. Various initiatives have been introduced to spur further interest in the PRS industry. On Jan 26, the Private Pension Administrator (PPA), which oversees the scheme, unveiled PRS Online to allow individuals to enrol or top up their PRS contribution directly via its website. PPA chairman Datuk Zaiton Mohd Hassan is confident that the numbers (AUM and membership) will continue to rise with the help of the online platform. PRS Online was launched together with the TN50 PRS Youth Incentive, a joint initiative by the SC and Ministry of Youth and Sports to promote retirement planning among youths. Under the incentive, Malaysians aged between 20 and 30 who contribute RM1,000 to a PRS fund will receive a matching contribution of RM1,000 from the government. Also, new members will enjoy zero sales charge when they sign up with any of the eight approved fund providers via PRS Online. The PRS is proving to be a significant retirement planning tool for youths, especially in the light of how millennials approach their careers. As at last December, the youth segment made up 28% of the total PRS membership base — a significant increase from just 7% in 2013. At the launch of PRS Online, the SC chairman pointed out that a growing number of youths prefer the flexibility of self-employment, thus they would not be covered under the mandatory retirement scheme. “Due to its features, the PRS would inevitably play a more vital role in providing an avenue for retirement savings. In this regard, education among youths can never be overly emphasised,” he said. Many PRS funds delivered better returns last year, compared with their lacklustre performance in 2016. According to data provided by independent investment research firm Morningstar, a significant number of the funds recorded double-digit returns for the year ended Dec 31, 2017. The core funds in the conventional growth category saw returns of 5.45% to 19.85% while those in the shariah growth category registered returns of 8.08% to 14%. The core funds in the conventional and shariah moderate categories provided returns of 6.34% to 17.76% and 6.89% to 14.45% respectively while those in the conservative categories registered returns of 1.85% to 10.31% and 2.10% to 5.88% respectively. Like in previous years, the conventional non-core funds performed relatively better than their core counterparts, with returns of 2.83% to 27.34%, while the returns of the shariah non-core funds ranged from -4.02% to 25.61%. According to Morningstar, CIMB-Principal PRS Plus Asia Pacific Ex-Japan Equity Fund Class A (fund size: RM158.94 million) came out tops for the year ended Dec 31, 2017, with a cumulative return of 27.34%. CIMB-Principal Asset Management CEO Munirah Khairuddin says the fund was fully invested throughout the year. Its performance was the result of applying a bottom-up stock-picking approach with a top-down macro overlay strategy. According to her, the strategy centred on companies with good fundamental growth and dividend-yielding stocks plus above average growth in earnings and sales. “We invested heavily in the technology, financial, industrial and consumer sectors, which benefited from the rising economic growth with mild inflation, improved corporate earnings and strong consumer spending. These sectors accounted for 86.37% of the total return in 2017,” she says. According to the fund’s mandate, 99.02% of its net asset value (NAV) is invested in a target fund — CIMB-Principal Asia Pacific Dynamic Income Fund — while the rest is held in cash. The target fund invests in Asia ex-Japan, of which 87.18% is in foreign equities. It mainly focuses on the financial (30.2%) and consumer (18.02%) sectors while 9.59% is held in cash. On the stocks the target fund will invest in this year, Munirah says companies with sustainable and better than average earnings growth profiles will be prioritised as they are projected to have higher earnings per share (EPS) growth than the general market this year. “These companies are predominantly driven by these themes — industrial automation, technology, consumption based on superior quality and exclusivity (premium), supply-side reforms in China, and margin and return on equity improvements,” she adds. The AmPRS-Growth (Class I), with a fund size of RM22.51 million, was the top performer in the conventional growth category last year. It recorded the highest cumulative return of 19.85% to outperform its 17 peers. AmInvest chief investment officer Fu Yew Sun attributes the fund’s performance to having good positions in North Asian equities, a strategy which many of its funds adopted last year. He also pointed to the fund house’s process that allows it to actively manage the portfolio. This lets the team make money for investors while managing the downside risks. “In equities, we are principally a growth investor looking for value. We have the benefit of a strong team that covers areas such as equities, fixed income and quantitative strategies, which enables us to form our investment decisions via a good combination of top-down macro views and bottom-up fundamental research,” says Fu. In the shariah growth category, Public Mutual PRS Islamic Growth outperformed its peers to deliver a return of 14% last year. Public Mutual CEO Yeoh Kim Hong attributed the performance to its technology stock picks. In the conventional moderate category, AmPRS — Moderate (Class I) outperformed its peers by providing a return of 17.76% for the year ended Dec 31, 2017. With a fund size of RM3.02 million, 39.51% of its NAV was invested in funds such as AmIncome Extra, AmDynamic Sukuk, AmConservative and AmIncome Reward. Its holdings were in various sectors, including IT, consumer discretionary, industrial products and trading/services, while 13.74% was held in cash. In the shariah moderate category, AmPRS — Islamic Balanced (class D and I) delivered a return of 14.45% to beat its peers. In the conventional conservative category, AmPRS — Conservative D outperformed its peers by providing a return of 10.31% for the year ended Dec 31, 2017. According to the fund’s fact sheet, 57.13% of its NAV was invested in local collective investment schemes, such as AmIncome Extra (31.03%) and AmIncome Reward (26.10%), while the rest was invested in various sectors. Only 0.91% was held in cash and other asset classes. In the shariah conservative category, CIMB Islamic PRS Plus Conservative (Class A) delivered a return of 5.88% to lead its peers. Kenanga Investors’ PRS funds also delivered strong performance. All four funds outperformed the market or their benchmarks by a good margin. OnePRS Growth and OnePRS Moderate saw returns of 17.83% and 17.63% respectively while OnePRS Conservative and OnePRS Shariah Equity Fund delivered returns of 7.23% and 12.37% respectively. “We believe the strong performance was due to the successful implementation of our bottom-up stock-picking strategy. Also, we were particularly focused on capital preservation. This allows better diversification and risk control,” says Kenanga Investors executive director and CEO Ismitz Matthew De Alwis. however, less than 10% of the funds registered such returns. Fund managers say 2018 could be a challenging year for investors as there will be many unpredictable factors in the global markets. Kenanga Investors executive director and CEO Ismitz Matthew De Alwis says this could be the most difficult year in the last decade for investors to navigate. The direction of inflation and interest rates will be the key financial movements to look out for this year, says De Alwis. Kenanga Investors will continue to rely on its solid research process to deliver targeted returns. 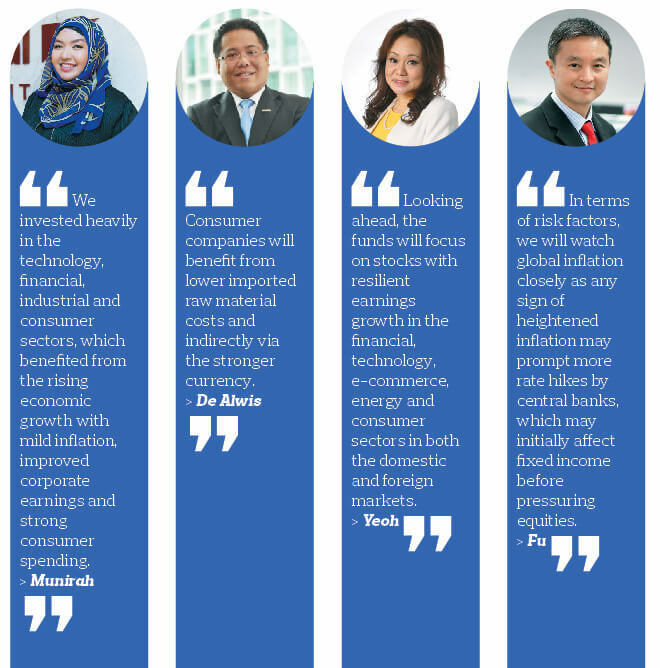 “The ringgit exchange rate will have a huge influence on the success of the local stock market. Diversification is key for investors and income-seekers will likely continue to face difficulties in their hunt for yield,” he says. CIMB-Principal Asset Management CEO Munirah Khairuddin believes the outlook for 2018 may be a tale of two halves. “For the first half of the year, we will continue to favour Asian equities because the persistence of a few key themes seems likely: the Goldilocks scenario, where global growth continues alongside subdued inflation; the gradual path of US monetary policy normalisation supporting a risk-on stance, which favours Asian equities; and Asian equities posting continued earnings upgrades and better growth prospects with 2018 earnings per share growth of about 13% versus the S&P 500 index at +11%,” she says. AmInvest chief investment officer Fu Yew Sun says what drove the market last year will remain the drivers for 2018. He is positive on emerging market equities, especially Asian stocks, as he believes they have better growth prospects and cheaper valuations. “Despite a rate hike expectation, we still anticipate emerging market bonds, including Malaysian bonds, to hold steady due to attractive yields and currency strength. In terms of risk factors, we will watch global inflation closely as any sign of heightened inflation may prompt more rate hikes by central banks, which may initially affect fixed income before pressuring equities,” says Fu. The key factors that drove the market, such as solid economic growth and benign inflation, will continue to be at play this year. This justifies AmInvest’s decision to undertake the same strategy as it took last year. “We will continue seeking growth at reasonable value on the equity side while seeking yield buffer for stability on the fixed-income side. In terms of geographical positioning, we are positive on emerging markets, especially Asian equities for better earnings growth and cheaper valuations,” says Fu. Public Mutual CEO Yeoh Kim Hong says global growth is projected to accelerate to 3.9% this year, from 3.7% last year, which will help underpin domestic growth at 5.3% to 5.4% in 2018. “In addition to selecting stocks within the domestic market, our core PRS growth and moderate funds will tap the wider investment opportunities in overseas markets given their increased mandates for foreign investments.